And now, "Seduced by Simplicity." With the encouragement from my dreamer husband, and my Nester friend I finally wrote the book. In this book you will hear about some of the ways that we had to simplify when our RV adventure began, but also the ways that we continue to simplify our lives, after moving into our cottage. This book will not be a book of should or should not’s, it will simply be the way that this eclectic family has chosen to live, simply. Once we were seduced by simplicity, our lives were changed forever. You will be able to purchase my book on Monday, woohoo! It will be available as an eBook download for you to read on your computer, or print off and bind if your prefer. ~How you can downsize your stuff yet keep your house. From bookshelves to closets and kitchens. ~How our children make money the simple way. Since we don’t pay an allowance. ~Menu planning that ads fun and creativity to your day. "Approached by a world of more, and faster, and bigger, Heather shakes her head in response and instead lets go- of things, of excess, of even what some would say are necessities. Simplicity is what so many, myself included, are drawn to and yet rarely give in to in any real and lasting way. 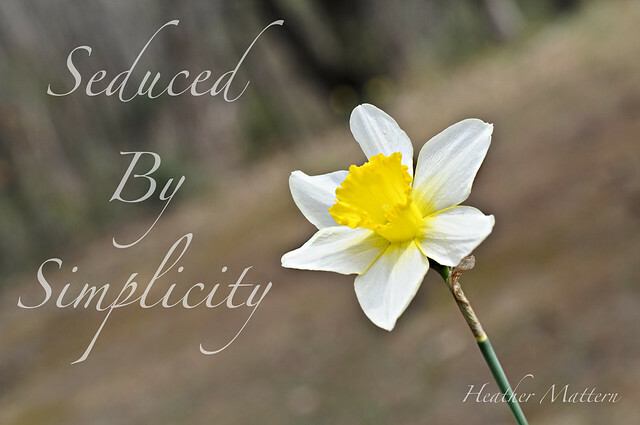 "Seduced by Simplicity" poses questions- quietly, humbly, as if by a close friend sitting with us at our kitchen table- and causes us to rethink all that we believe is needed for a content life. Dig deeply and decide for yourself if you will follow the path of less. This is an easy, gentle read, one that will work on your heart in meaningful ways." Cool! That looks like an interesting read. I hope it will be enjoyed and inspire others! Enjoy your hot coffee Erin! Rambling Heather, well done to your visionary husband on encouraging you to write.it.down. I look forward to your story. It can be loaded onto my Kindle, right? Your book sounds wonderful Heather, exactly what I'm looking for!How can I get a copy? Thanks again so much for the tumbler! I am so so excited! Looking forward to your ebook as well! We live in a small house so simplicity is key for us! What a nice blog layout you have! Hey sweet Heather, Congratulations on your new book! I'm so excited for you and so proud of you! P.S. Is your blog on blogger? If so, can you tell me how to set up my comments to reply like you have??? Yay-just got the travel mug in the mail today! Can't wait to try it out! Thanks again so much-this made my week! Again, you rock! :) Great job!